Behind an old iron gate in the 3rd arrondissement lies the surprising sprawl of the Marché des Enfants Rouges, the oldest market in Paris at 400 years old. While an exciting destination for foodies – you have your pick of Japanese bento boxes, Lebanese sandwiches, fresh pressed juice, gluten-free brownies, towers of Moroccan couscous, buckwheat crêpes and more – the choices and lines can be overwhelming, and not every stand is equally excellent. Read below for our tips to navigating the market and the food for which we think it’s worth braving the masses. The covered market’s name, literally “market of the red children”, references its origins as an orphanage where the children were dressed in red, the color of Christian charity. 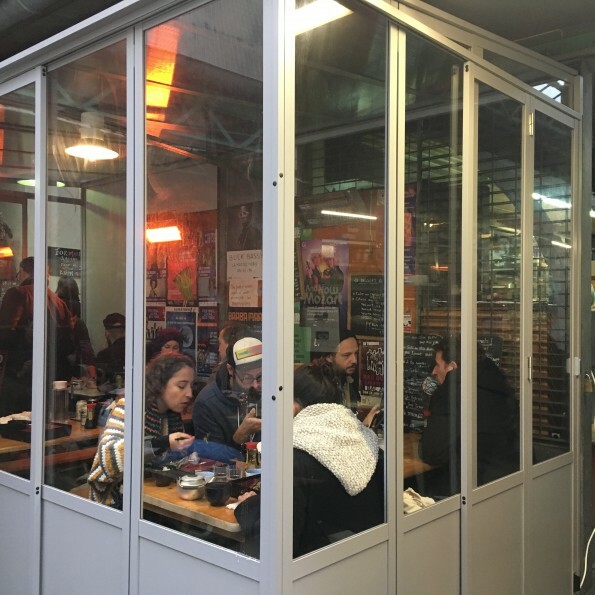 A market established on the site in 1615 became a hub of life in the Marais, but was threatened during the 1990s when the Mayor wanted to tear down the historic structure and turn it into a parking garage. Neighborhood residents banded together to save it, even chaining themselves to the gates to prevent the development going ahead. The site languished, boarded up and abandoned, for six years but its supporters eventually triumphed, with a renovated market reopening in 2000. 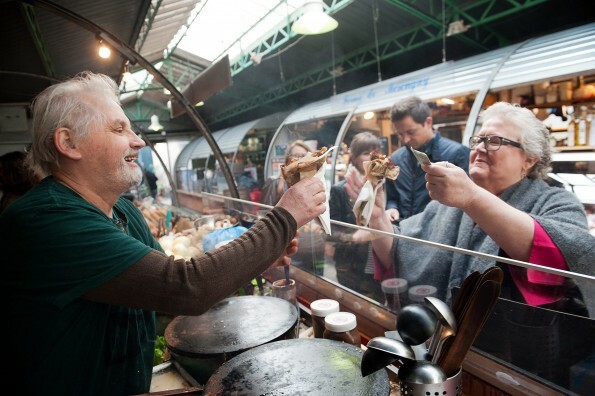 Although originally a produce market for raw goods, the Marché des Enfants Rouges transformed with its revival and became a dining destination. While you can shop here for ingredients, there are better markets purely for produce. This is an eater’s market. As such, although open from the morning until around 7pm, the market comes alive (read: gets packed) for lunch and, on the weekends, brunch. This isn’t a food court: each stall operates as a separate restaurant so eat-in diners should consume their food at a table at the stall where they ordered. To avoid the crush, you can always take your meal to go, and eat in the nearby Square du Temple. If you’re going to get a single burger in Paris, it should be this one. 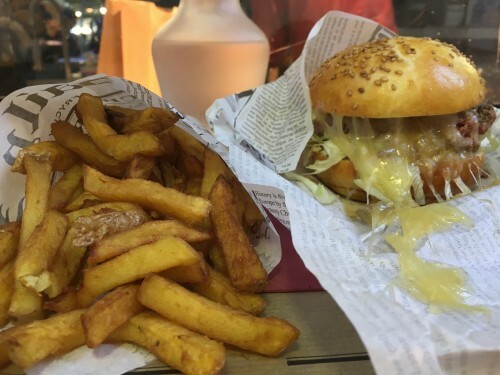 Burger Fermier’s are, as the names promises, made with farm fresh meats from Audincthun in northern France, homemade buns and a selection of cheeses straight from small producers. Served in a faux newspaper wrapper with a cone of fresh fries and homemade sauce for, it’s a steal for the quality at only €10 and probably the best thing to eat in the entire market. Giant jars of terrine, several cuts of fresh meat and sausages from farms in Picardy are also available to take home. It’s best to arrive early for lunch as stock often runs out. Look for the longest line and park yourself at the end of it. 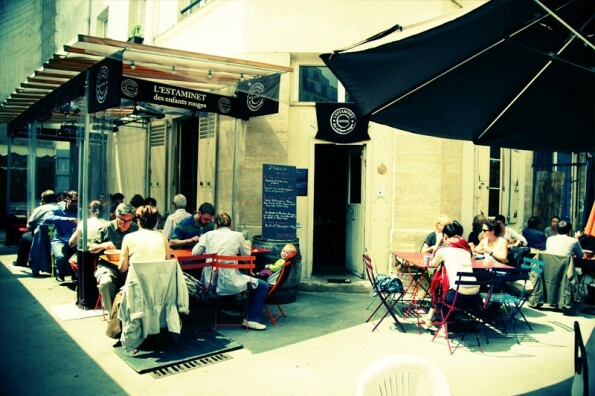 That’s the way to find Chez Alain Miam Miam, where the crowds queue for buckwheat galettes, griddled sandwiches or socca, a chickpea crêpe from Nice that we don’t often see in Paris. Alain is quite a neighborhood character and will at least make the lengthy wait entertaining with his playful antics. There aren’t any seats here so plan to eat and stroll. 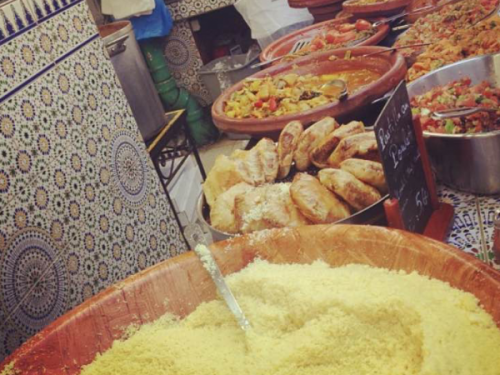 There’s couscous for days at this restaurant that offers a variety of tagines, pastillas, cold salads, nutty sweets, flatbread, and mint tea. Accordingly, its tiled tables in a sunny part of the market are always packed, but it’s worth the wait. This is one of the better options in the market for vegetarians, too, as there are several veggie based options. Go for anything deep fried at this stand: cod croquettes, fried chicken, or the excellent tofu donburi bowl.The bento box, which lets you sample one of the mains with rice, vegetables and sushi, is good value. This is one of the most comfortable restaurants in the market in cold weather thanks to its glassed-in patio with heat lamps. This tiny bistro cares about its products and has a menu that changes with the seasons. It occupies the largest and sunniest section of the market, so is swamped with people sunning themselves like lizards when it’s warm out. 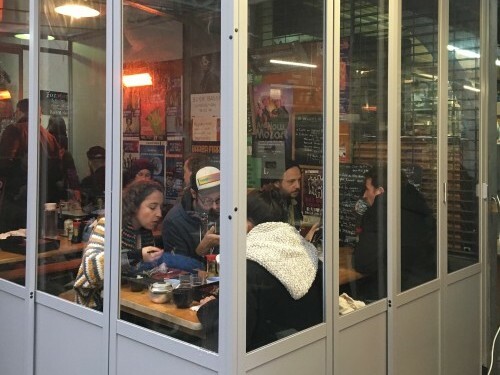 So avoid it in the heat, and at brunch, when it can be a chaotic free-for-all: L’Estaminet is at its best in the winter when there’s an oysterman outside shucking bivalves to order and a giant pot of vin chaud on the burner. The terrace is even still functional with the addition of heat lamps and fleece blankets. 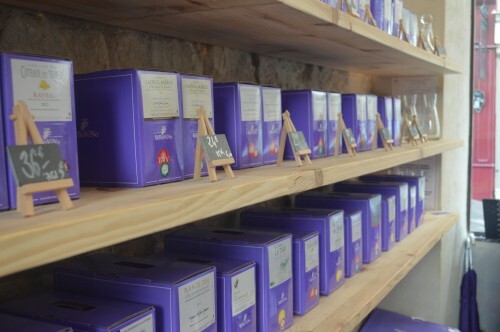 It’s impossible to miss this wine bar full of purple boxes of wine. Yes, boxed wine. Bibovino works exclusively with high quality producers to offer a range of boxed wines that you’ll actually want to drink. It’s available by the glass or carafe, or you can buy a box to take with you. The wine bar has a great view of the market and offers a small selection of cheese and charcuterie plates, so it’s an ideal place for an apéro. There’s not even a whiff of fish at this seafood stall in the center of the market; the wide selection is as fresh as can be. 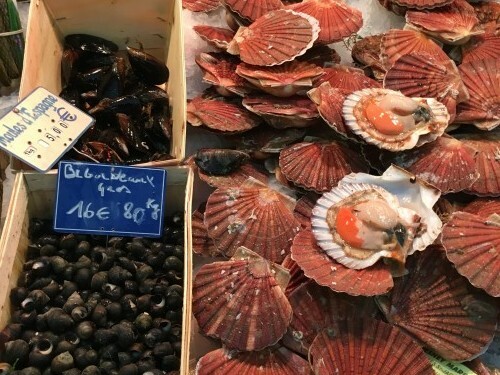 Look for scallops on the shell, bulots (sea snails), shrimp in sizes ranging from tiny to big as a fist, and several types of whole fish butchered to order. The fragrant scent and bright colors of this flower stand are the first thing to greet visitors walking through the main entrance to the market on rue de Bretagne. 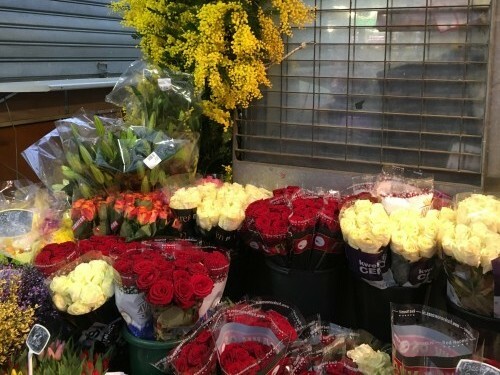 The selection is great, service is sweet, and the prices, usually 5-10€ for a bouquet, can’t be beat.